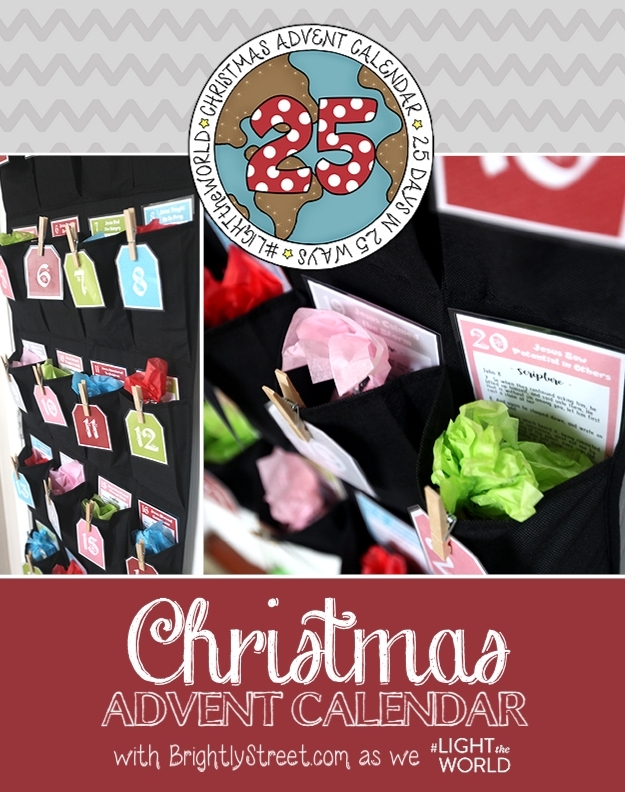 I am really excited to share with you an interactive Christmas Advent Calendar that you will not want to miss this year. Every year at Christmas time, I have high hopes for my family especially my 5 children. I want them to experience all that the Christmas season has to offer such as the Christmas lights, trees, yummy food, fun events and the feelings of goodwill that can and is felt during Christmas time. One of the things I always wish I had put together was an advent calendar, but the thought usually doesn’t come until part way through the month of December. This year, I was inspired to not only just dream about having great memories with my family as we soak up the Christmas spirit, but I wanted to do something about it. I heard about the amazing idea that Mormon.org came up with called 25 Days in 25 ways. Here’s a short peek at what the invitation is to not only Mormons, but people of all faiths. That’s the idea… Focus on Service this season if you truly want to feel the Christmas spirit! Are you excited and ready to join me and millions of others as we catch the spirit of Christmas through service? There has never been an opportunity to serve someone that I haven’t felt like my own burdens have become lighter. There is something so very magical about serving others. Now, mix that with what is already felt during the Christmas season and you are bound to cook up some amazing and unforgettable experiences. 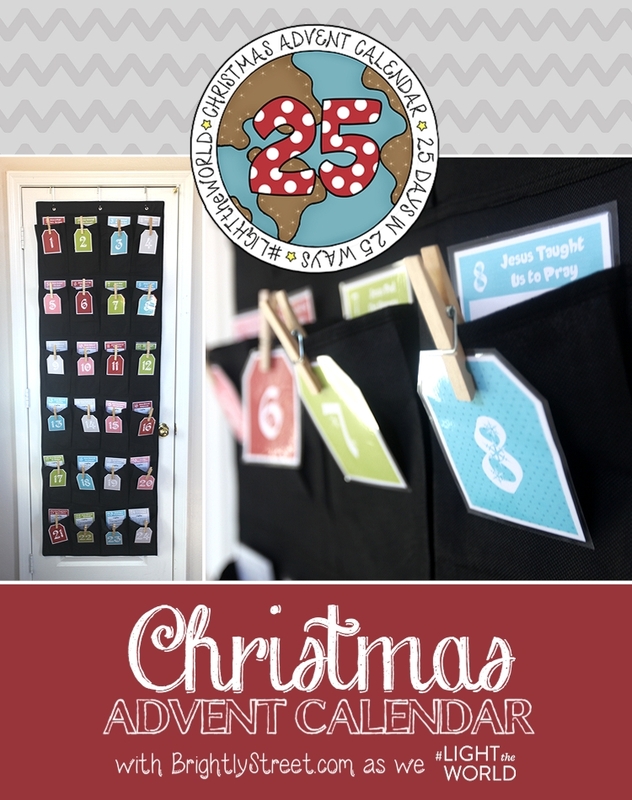 To help my family and get back to that goal of creating some awesome memories with my family, I took the idea of the Christmas Advent Calendar found here and came up with my own twist! Get ready for a great December as we focus on the life of Jesus Christ and how we can follow in his footsteps in service to others. Since this is a pretty intense calendar we are going to break it into two blog posts. Step 1: First step, download all the free printables that I have created for you. I would suggest printing them on white card stock and laminating them so that you can use them every year! Just put them in with your other Christmas decorations, they will start to become one of your favorites to pull out! Now, head to the store with my shopping list to pick up all the fun treats and ideas to make this an unforgettable month! Don’t forget to purchase an over-the-door shoe organizer like the one pictured above. I purchased this one at Ross for just $5.99, that’s a steal. I have them all over my house in different organizing purposes. Now, this is no ordinary Advent Calendar filled with just chocolates and treats, this will take you back to Christ’s time as we reflect, watch, listen and then act upon the life that Christ lived while he was here on earth. We are going to bridge the gap of over 2000 years and share the same spirit that was felt long ago with those around us, starting within our own home. 25 Day Tags: Attach each one to a pocket on your shoe organizer with a wooden laundry clip. Since there are only 24 slots, #25 will be placed on the tree with the advent surprise wrapped up, underneath your Christmas tree. Advent Cards: Place cards in coordinating days. Each day pull out a card, read the scripture, find the activity you will be doing and scan the card! Yes, that’s right, this is an interactive calendar, remember? 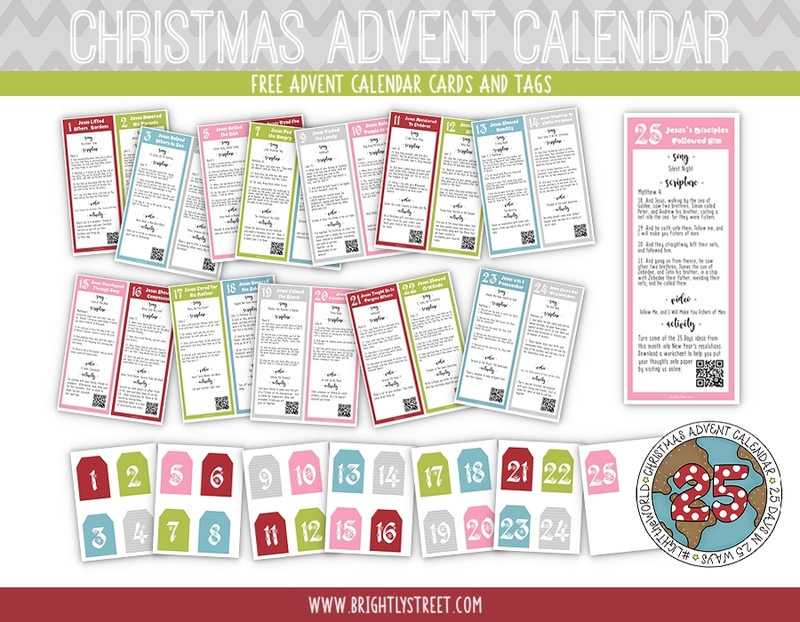 Just grab your phone, scan the QR code at the bottom corner, each card will have a unique code, and you will be directed to the coordinating day where you can watch the bible video that coordinates with the day’s theme from the 25 Days in 25 Ways calendar. You will also find a Christmas song that will bring the Christmas spirit into your home as well as an activity idea with any printables that you might need for the day. I used a lot of the ideas that are available here, but I also came up with a few of my own. I tried to keep it simple with most days activity being very simple and then just a few activities that might take a little more time so that it is doable everyday. You can also just pick and choose when you want to do an activity or not. Even just listening to the Christmas songs everyday will help bring the spirit of Christmas into your home, but if we can #LIGHTtheWORLD with service and learn about the Savior at the same time… well that would just be fantastic! Scripture Tags for 2017: This year’s advent calendar is similar too last year so I decided to keep it the same. Mormon.org is using different scriptures so here they are. Just drop them into the matching days and read them in the morning or night. You can use these cards or just do the ones from last year. It really doesn’t matter, just “Light the World” with Christmas service this year! Surprise Bags: Just like the advent calendars that have one piece of chocolate each day until Christmas day, this calendar has treats too just not all of the chocolate nature, don’t worry they are awesome and will surely bring smiles to your little ones faces. A lot of thought went into this calendar and I wanted the treat or tiny gift to fit the thought for the day such as Day 1’s theme is “Jesus Lifted Others Burdens.” There are 4 little plastic planes for my kids to play with as I talk to them for a minute about how Jesus “lifted” others and so can we just as an airplane can “lift” it’s passengers in the air and carry them to their destination. Christ lifts our burdens and sometimes carries us into a different direction where we can grow, learn and find more joy. What’s Next? Follow Step 2 as we #LIGHTtheWORLD this Christmas. Thank you so much for sharing your talents and ideas. I love the calendar and everything! This is absolutely AMAZING!!! Thank you so much for taking the time and using your talent to do this. We have been looking for a way to help engage our YW more in the Light The World Campaign and the QR codes are perfect for them!!! Did you do an updated 2017 version of the QR codes?? No worries if not, I’ll just print the ones from 2016….just thought I’d ask. No since 1000s printed and used them last year we kept the QR codes the same we added the new 2017 info and kept 2016 too so you can with either year it is all for the same theme so I think it works! Thanks! The new scriptures don’t match with the right days topic now. 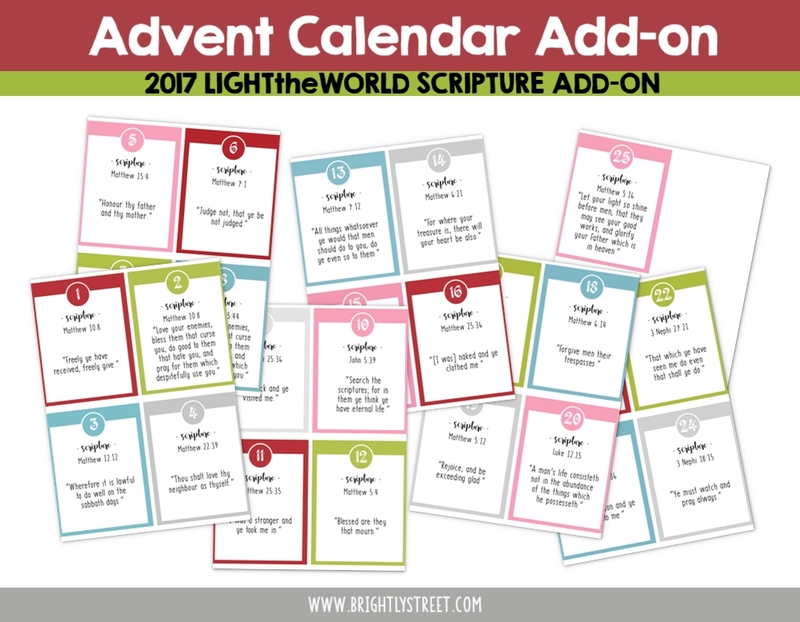 Yes, I know the advent calendar would of taken more time then I had to fix and create all new content so I just added the scripture cards that are new this year to the correct days. Each day has both the new videos for 2017 and the ones for 2018. Do you have another link to just the qr codes and days to where I don’t have to print out the calendar cards from last year? super cute idea, love it! thank you!